Last Monday, Rob Eisenberg released Aurelia.js. This was a culmination of sorts of a whirlwind of activity that was kicked off when Rob left the Angular 2.0 team at Google. A lot of people wondered what he was up to (including me! ), so I asked him to be on the show to talk about what’s been going on. We talk about SPAs, why he left Google, what’s special about Aurelia, how to handle learning all of these frameworks, and much more. 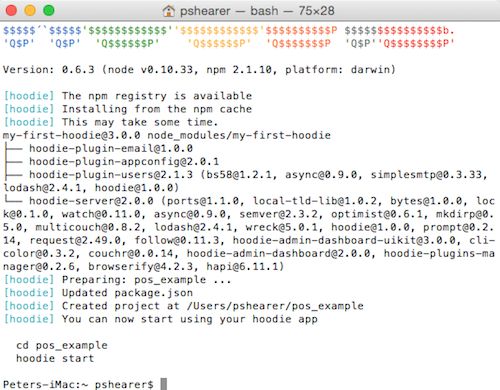 Last time, we got Hoodie installed and made the first simple application. If you had done it correctly, you would have been able to add ToDo’s and then remove them by clicking them. Let’s make another application, and while Hoodie supports templates to create applications, I’m just going to have it make the default application again and we’ll replace what we don’t need. If we do issue a cd part2 command, we end up inside the application folder. Let’s take a look at what file are contained in the folder by default. package.json – As you can probably tell by the installation process we had to follow last time, Hoodie applications are really just Node.js applications and Node.js apps need a package.json file. We get the name of the app here as well as the list of dependencies that it needs to keep up to date and deploy. data folder – This folder is our database. You actually won’t see it the first time, but instead it is created the first time you run hoodie start. If you want to easily wipe out everything for the app, renaming or deleting this folder will cause a brand new database to be created. www folder – Everything for the application, asset-wise, is here. All HTML, CSS, JS, images, etc live in this folder. Treat this like any other web root, Hoodie doesn’t do anything to new files in here that would cause you to lose your work. If you go digging around our directory, you aren’t going to find that file at all. The reason is because the Hoodie server serves that file up dynamically by itself. 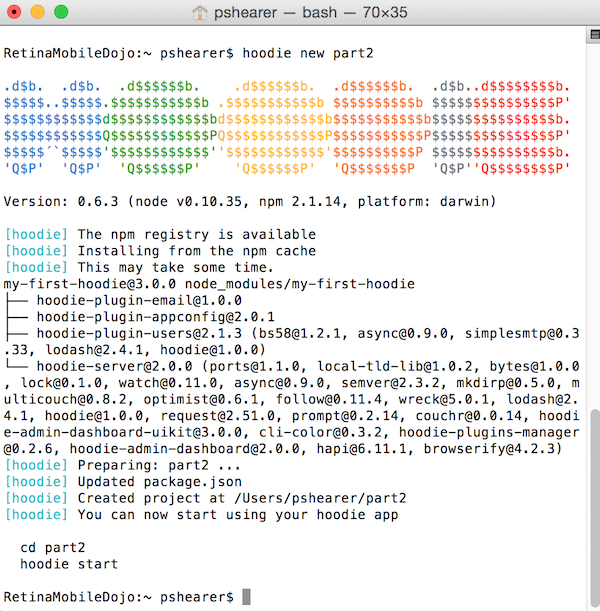 Not only is the goodness of Hoodie in this file, but it also has the front-end code required to work with any of the plugins that you’ve installed along with the app. The HTML file should be pretty self explanatory. 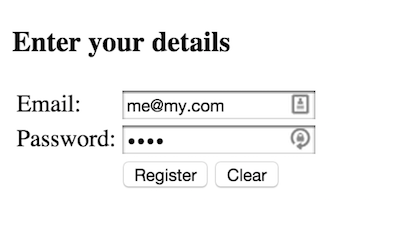 I just made a simple form that takes an email and a password. 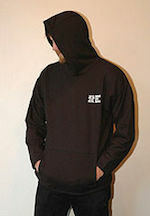 We include the hoodie script file and our own script file and jQuery. If you call hoodie start and give it a password for the application (first time only), you will get the default screen that we had before. After that, we have a block of code that is wrapped inside of the jQuery document ready method. Much of the code is concerned with trapping variables and manipulating the screen, but we should be interested in the two lines that are “Hoodie-centric”. Our hoodie variable that we declared earlier has an account property that accesses the account store inside of the CouchDB instance. 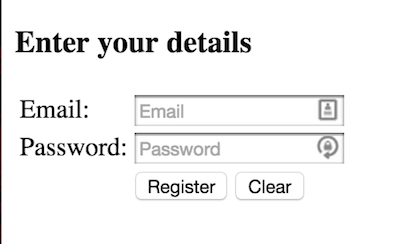 Account has signUp(), signIn(), signOut(), changeUsername(), resetPassword(), and changePassword() methods that you can call. 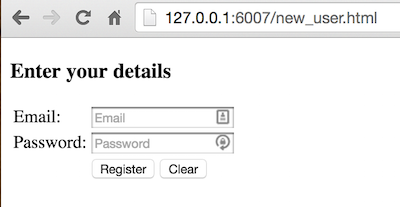 The signUp() and signOut() methods also allow you to provide a callback, which we did and used to manipulate the DOM. All very simple and basic, which is definitely what the Hoodie developers were trying to accomplish. When I put in an email and password, and click register, I get logged in and greeted. So, what did we do? Did we really just create an account? Go back to the main page, for me that is http://127.0.0.1:6007, and go to the upper right hand corner, hit the drop down arrow and choose to sign in. You will be presented with a form. Put in the information that you registered with on our page. You will now be shown as signed in. We really did create an account. That’s it for this time. Next time, we’ll try creating some custom objects and see how easy (or hard) that is with Hoodie. Some time ago, I was browsing Reddit or Hacker News and I came across a link to something called Hoodie. Of course, that’s an appropriate sounding programmer framework name, but what is it? In their own words, “Hoodie enables you to express yourself through technology by making web app development very fast, easy and accessible. It’s a complete backend for your apps: develop your frontend code, plug it into our API and your app is ready”. Well, doesn’t that sound convenient? But, who is it for? Quoting their site again, they say, “Currently, Hoodie is mainly for frontend developers who want to build their own applications based on it, and for Node.js developers who want to help us extend Hoodie’s core by building plugins. Hoodie’s future goal is to be accessible for designers and people with few coding skills because we think this matters”. Okay, well right away, some of you might lose interest because you aren’t designers and you would probably be offended if you were described as having “few coding skills”. However, I do agree with the Hood.ie team and it does seem that web development is still somewhat of a matter of privilege. I wrote a post back in May, 2013 called How Deep is the Rabbit Hole. In the post, I took issue with another blogger who was complaining about all of the things that developers had to know in order to be viable developers. I still hold to my stance. I believe professional developers can get by knowing a few things, but as they are in the game for awhile, they will learn more and more about their craft. There is no shame in that. At the same time, if someone wants to build a simple functional application, should they have to learn the entire full stack of development – soup to nuts? We aren’t talking about “Enterprise Class™” code here. I’m talking about someone who wants to build a simple application who only knows the basics of Web UI from a design perspective. That’s who Hoodie serves and who my audience is for this series. At the same time, if you are more of a full stack developer, it doesn’t hurt you to learn more about other tools either. While you may see Hoodie to Web Apps what Access is to Databases, that doesn’t mean that the tool doesn’t have an audience and it doesn’t mean that it hurts to have it in your tool belt to offer as potential solutions to clients or to friends. You can find out how to best install those for Windows, Mac, or Linux over here. Doing as it suggests, once I cd into the directory and call hoodie start, I get this output. 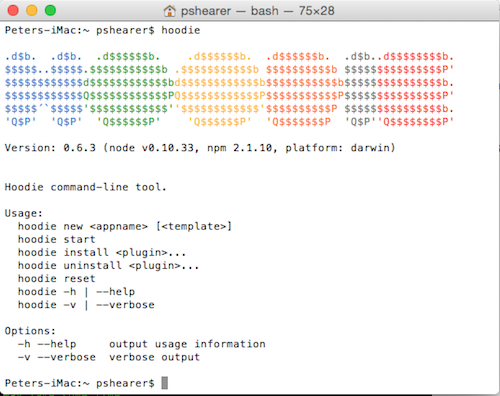 Peters-iMac:~ pshearer$ cd pos_example/ Peters-iMac:pos_example pshearer$ hoodie start .d$b. .d$b. .d$$$$$$b. .d$$$$$$b. .d$$$$$$b. .d$b..d$$$$$$$$b. $$$$$..$$$$$.$$$$$$$$$$$b .$$$$$$$$$$$b $$$$$$$$$$b $$$$$$$$$$$$$$$P' $$$$$$$$$$$$d$$$$$$$$$$$$bd$$$$$$$$$$$$b$$$$$$$$$$$b$$$$$$$$$$$$$$$b. $$$$$$$$$$$$Q$$$$$$$$$$$$PQ$$$$$$$$$$$$P$$$$$$$$$$$P$$$$$$$$$$$$$$$P' $$$$$´`$$$$$'$$$$$$$$$$$$''$$$$$$$$$$$$'$$$$$$$$$$P $$$$$$$$$$$$$$$b. 'Q$P' 'Q$P' 'Q$$$$$$P' 'Q$$$$$$P' 'Q$$$$$$$P 'Q$P''Q$$$$$$$$P' Version: 0.6.3 (node v0.10.33, npm 2.1.10, platform: darwin) Initializing... CouchDB started: http://127.0.0.1:6003 Waiting for CouchDB [---*--] SUCCESS prompt: Please set an admin password : WWW: http://127.0.0.1:6001 Admin: http://127.0.0.1:6002 Starting Plugin: 'hoodie-plugin-appconfig' Starting Plugin: 'hoodie-plugin-email' Starting Plugin: 'hoodie-plugin-users' All plugins started. [hoodie] Hoodie app is running! .d$b. .d$b. .d$$$$$$b. .d$$$$$$b. .d$$$$$$b. .d$b..d$$$$$$$$b. [hoodie] Hoodie app is running! That’s it. As an introduction, we’ve gotten started with some generic scaffolding, but next time, we’ll look at how we can leverage Hoodie to make something a little more useful. Recently, I was listening to the .Net Rocks! 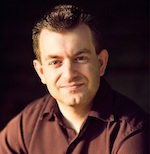 Podcast and Miguel Castro was on talking about MVVM for the web. I only mildly care about the topic, but I like to listen to things even outside of my normal sphere of interest to broaden my range of knowledge. Another side benefit is that sometimes you get unexpected gold nuggets thrown your way. This was one of those times. To get started using it, you can either download it from the link above, or you can use npm, NuGet, or bower to install it. From there, you can just reference it into your web page. Alternatively, you can just reference it from a CD and never do the install (//cdnjs.cloudflare.com/ajax/libs/moment.js/2.8.3/moment.js is one). I’m starting out with this shell of a page. I made a div with the id of playground here I can write out output from Moment.js without using alerts all over the place. I’m going to wrap all of the calls to moment in the writeToPlayground method to get the output. I have this shell – including all of the code in this post – as a jsfiddle that you can access at http://jsfiddle.net/PeteOnSoftware/pe4n383h/ to help make it all as clear as possible. To get started with moment, you just have to create a moment object and then call the format or calendar methods. But, better than ALL of those things is this next little beauty. If you use .Net as a REST API, whether through WCF or through WebApi, you are probably going to be used to seeing dates returned like this: /Date(1198908717056-0700)/. This is some tainted version of a JS date that doesn’t quite conform to standards that other people are using. If you try to deserialize it in JS, it fails, with or without the -0700 part. The issue is that JSON doesn’t specify a date format, so Microsoft returns *kind of* what you’d need to parse the date. The 1198908717056 part is the number of milliseconds since the Epoch and the -0700 part is supposed to be the timezone offset. Here are some examples of what would happen if you tried to just naively parse what you got back, or if you tried to parse it after doing some manipulation. However, Moment.js just takes that .Net value returned and handles it like a champ. That just makes my day! 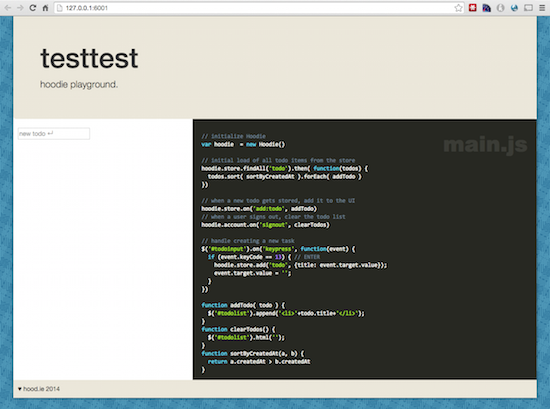 If you want to know more about Moment.js, go check out its page and documentation here. If you just want to play around, go check out my JSFiddle and mess with my examples or just enter sample dates into the textbox and click the PARSE button to see what Moment.js will do with your input.